Copy the link below and send it to your friends! The official scoring rules of Air Hockey as decreed by the USAA. Scoring a goal earns you 1 point. First to 7 points wins. No time limit. The scoring rules of the Air Hockey table at your local gaming arcade or pub! Scoring a goal earns you 1 point. First to 7 points wins. If no winner after 5 minutes, the player with the highest number of points wins! Starting for 5 points, scoring a goal earns you 1 point, whilst conceding a goal loses you 1 point. Dropping to 0 eliminates you from the game. Getting to 10 points wins you the game. No time limit. If you concede a goal, you're out. Last person left standing wins. No time limit. The mallet is controlled by either the keyboard or mouse. You can change your control method in the settings menu. To control the mallet with the keyboard, use the directional arrows as shown in the image. In order to move the mallet in a diagonal direction, press a combination of these arrow keys (e.g. up and right, to move in a north east direction). Mouse controls are also available for 360° movement. Whilst using the mouse controls, click and hold the middle button and drag the mouse to rotate the camera angle. 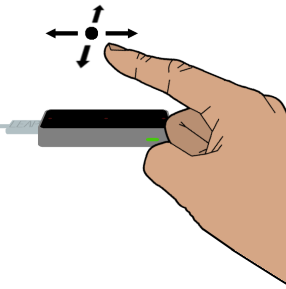 If you have a Leap Motion controller, you can also use that to control your mallet. Simply connect it up, and select the 'Leap' option in the settings. To control the mallet, hold 1 finger out over the device, and move it around in the desired direction. A player cannot leave the zone they are currently in. When a puck arrives in a goal the last player to hit the puck with their mallet scores. The puck is then placed in the zone of the player that conceded. This game requires good defence as shots can come in at a variety of different angles. But don't be shy as you still need to score. The official scoring rules of Air Hockey as decreed by the USAA. Scoring a goal earns you 1 point. First to 7 points wins. No time limit. The scoring rules of the Air Hockey table at your local gaming arcade or pub! Scoring a goal earns you 1 point. First to 7 points wins. If no winner after 5 minutes, the player with the highest number of points wins! Scoring isn't everything! Starting for 5 points, scoring a goal earns you 1 point, whilst conceding a goal loses you 1 point. Dropping to 0 eliminates you from the game. Getting to 10 points wins you the game. No time limit. Defence, defence, defence! If you concede a goal, you're out. Last person left standing wins. No time limit. Would you like to post your score?